Did I buy a schnauzer? I was told Sadie is a schnauzer...but she doesn't act like the other schnauzers I've owned. I'm wondering if she is mixed with a Jack Russell. What do you think? 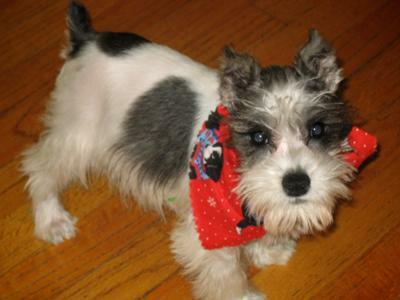 Comments for Did I buy a schnauzer? Yes, your baby is part snhnauzer. i think part jack too. someone told us the same thing and our barbie girl looks just like your baby. our barbie is the sweetest, most affectionate, we werent sure what she was period till she grew up and now she is 9-10 months. she is one of a kind and you and i are blessed to have these pets!!!!! Looks like a schnauzer to me.